Now, that's a drinking glass! A new set of 2 will be introduced every month in 2013! Check out the images of the Third Doctor! Inspired by the BBC's Doctor Who TV series. 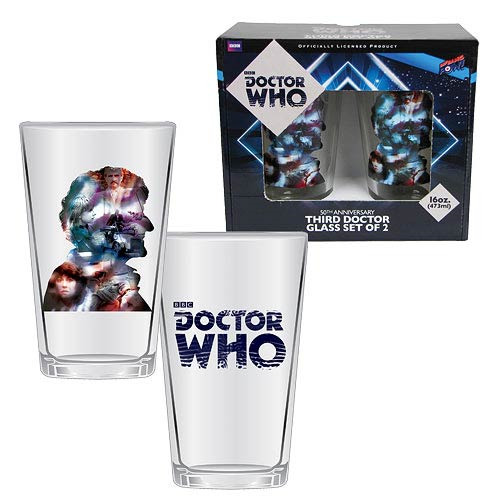 Inspired by the BBC's hyper-popular Doctor Who TV series, this 2-pack of tapered, clear, 16-ounce pint drinking glasses is just what the Doctor ordered. Each set of two glasses features a 4-color collage of unique 50th anniversary silhouette head art of one of the 11 Doctors, and a new set of 2 will be introduced every month in 2013! Loyal fans of the Doctors are sure to recognize these images of the Third Doctor. Hand wash only. Not dishwasher safe. Do not microwave. Thoroughly hand wash before first use. Ages 14 and up.